Cyclone Lam, Pam and now Nathan – natural disasters have filled our news in recent weeks. They wreak havoc in poor and vulnerable communities and cost billions in recovery and aid funding. These disasters happen when a natural hazard – such as a cyclone, bushfire or earthquake – damages human systems. They seem to be becoming more frequent and worse – but are they really? Some natural hazards occur because of forces outside our control. For example, the movement of Earth’s crustal plates triggers earthquakes and tsunamis. Variation in solar radiation entering the atmosphere and oceans triggers storms in the summertime and blizzards in winter. The movement of energy in Earth’s system is what drives these natural processes. 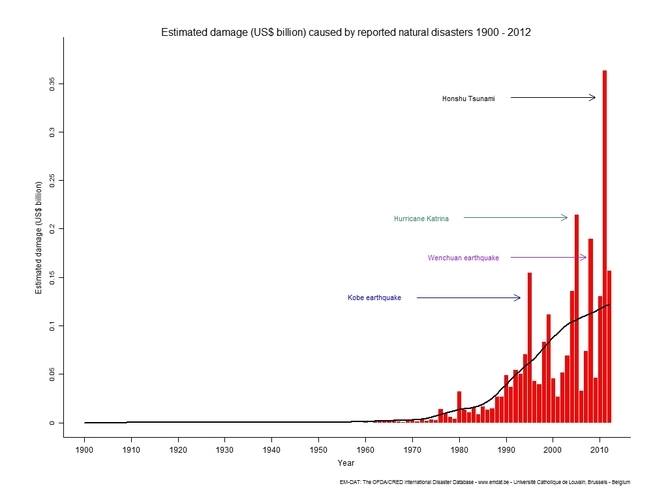 Despite these normal processes, experts now say there is no such thing as “natural disasters”, for three reasons. First, humanity is interfering with the Earth system. For example, as we drive anthropogenic climate change we are adding more energy to the system. This increases the probability of more frequent and intense “hydro-meteorological” hazards such as floods, bushfires, heatwaves and tropical cyclones. Second, we are (mis)managing natural systems. For example, removing the buffering protection of mangroves on the coast means a storm surge can be more disastrous. Third, our settlements are sprawling out across the Earth’s surface into geographic areas where natural hazards occur. This exposes us to harm and loss when the inevitable happens. Potentially hazardous events do not need to end in a disaster. Disasters occur because of the intersection of hazard with exposed people and assets that are vulnerable to the hazard. They are characterised by a lack of resilience and poor capacity to cope and respond in the affected area. Without vulnerability there can be no disaster. For me, disasters are a social construct and are about people. I make no apologies for taking such an anthropocentric view. The United Nations International Strategy for Disaster Risk Reduction (UNISDR) and the global EM-DAT disaster database record and assess data on the occurrence of “natural” and “technological” disasters by individual countries and regions. Their annual reports make it possible for us to explore trends over time. Although the definition of disaster changes between countries and the accuracy of collected data varies across the globe and through time, one trend is clear. Events we label “natural disasters” are occurring more frequently than in the past. Who Or What Can We Blame? 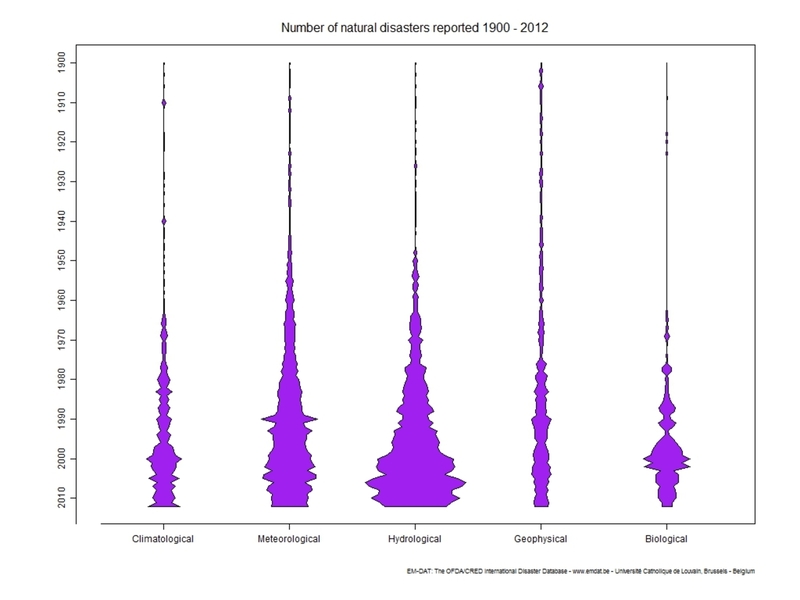 The big question is does this trend represent a statistical change in the physical occurrence of natural disasters or an increasingly vulnerable global population (or both)? Ok, I’m going to put my neck on the line here and say that there is no strong evidence that more earthquakes or volcanic eruptions are happening today compared to a century ago. However, given anthropogenic climate change, it is “more than likely” that the frequency and intensity of hydro-meteorological extreme events have increased. Such was the finding of the most recent IPCC assessment report. That said, the patterns of these physical processes across the globe are highly variable. Regardless of any change in the fundamental Earth system processes driving extreme events, human activity, environmental mismanagement and variations in resilience and vulnerability are contributing to the increased effects of hazard events. This has led to the declaration of more disasters and ever-increasing human and economic losses. This is clearly illustrated below. The next question that emerges is: “Are vulnerability and resilience uniform across the globe?” Sadly, the answer is no. Put bluntly, those that are poor will be the hardest hit and least able to cope. All disaster-related research shows that countries where social and economic capital is limited are the most vulnerable. Work by our team following the 2004 Indian Ocean tsunami disaster in Thailand explored how poverty and lack of resources was a major contributor to what made many in coastal communities so vulnerable. Poor and disadvantaged people living in richer countries are also vulnerable. 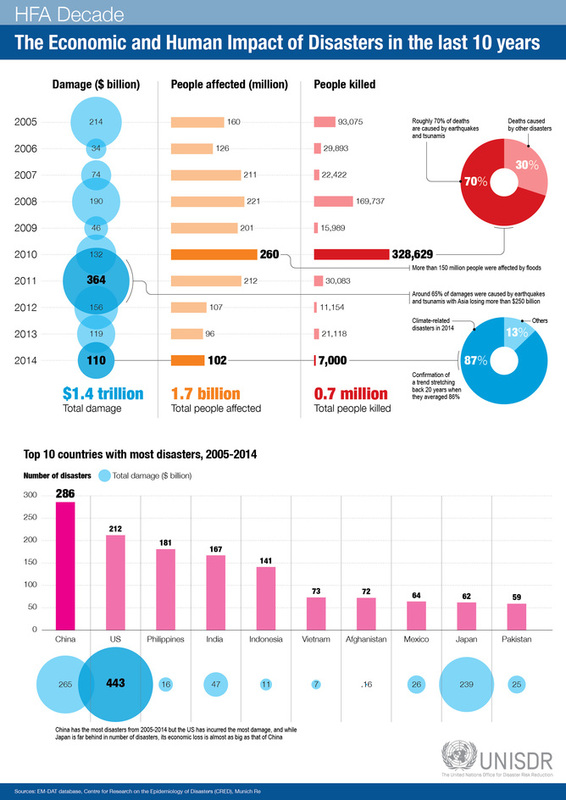 To date, global data show that Asia is where the most people have been killed (according to EM-DAT more than 26 million since 1904), the greatest losses (more than US$1.2 trillion) have occurred and the most frequent disasters are clustered. Given the rapid development and increasing population of the Asian region, future disaster losses can only be expected to climb. Major social, political and institutional change needs to happen rapidly to reduce vulnerability and increase resilience. Without question, anthropogenic climate change will result in changes in the frequency and severity of hydro-meteorological disasters. However, the changes will not be uniform globally, with some areas experiencing more frequent events, other places less frequent events. There is significant complexity and uncertainty about these future trends but much research is underway to investigate this issue. For example, in Australia, research suggests tropical cyclones will become less frequent but the severity will increase. By contrast, in the Mediterranean region recent research has suggested significant future variations of rainfall extreme events with some locations likely to experience more rainfall events and others less. So, yes, the number of (natural) disasters occurring is on the rise but this is because of a complex set of interactions between the physical Earth system, human interference with the natural world and increasing vulnerability of human communities. Dale Dominey-Howes will be on hand for an Author Q&A session between 9.30am and 10.30am AEDT on Wednesday March 25. Post your questions about natural (and non-natural) disasters in the comments section below.